Arthur Duffey, left, set the world record in the 100 yard dash in this May 1902 race captured by photographer W.N. Jennings. 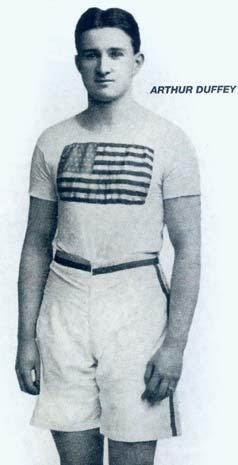 On May 31, 1902, 22-year-old Arthur Francis Duffey, a Bostonian with ties to the city’s Roxbury and Dorchester neighborhoods who was at the time a student at Georgetown University, burst from the starting line of the 100-yard sprint in the national intercollegiate track and field championships at the Berkley Oval in New York City and hit the tape 9.6 seconds later, in the process lowering the world’s record from 9.8 seconds. Duffey’s time earned him the designation of “world’s fastest human”; it was a number that would not be bested for another 28 years. In the half decade comprising the last years of the 19th century and the first few of the 20th, an era when amateur sports dominated newspaper coverage, the name Arthur F. Duffey stood for sturdiness of purpose and excellence of accomplishment. During those years, he competed, and won, across the United States and he traveled to Europe and Australia, where he was regarded as a running superstar. “King of the English Sporting World” read the headline over a Boston Globe story about Duffey’s win in a July 1902 race held in Sheffield, England. Then, in November 1905, the run was over; all of his records were ordered erased in perpetuity by a national amateur track organization, the Amateur Athletic Union (AAU), in the wake of never-confirmed reports about sponsorship money and improper dealings with a shoe company. As far as the formal world of amateur sports was concerned, Arthur Duffey had never run a race in any of its competitions. The public record of the time shows that for many track fans, the case was one where a zealous rectitude had prevailed over fairness and any sense of justice. Arthur Duffey: Inducted into USA Track and Field Hall of Fame — more than 100 years after his career ended.There was minimal public notice given locally – a few lines in a Globe sports pages update on Olympic matters –to a ceremony held in Daytona early this month where Arthur Duffey was inducted into the USA Track and Field Hall of Fame. But to Arthur Duffey’s descendants, the induction was the resurrection of man and his reputation as a runner without peer in his time, something that he and they had been seeking for more than 100 years. There is a case to be made that Arthur Duffey initiated the proceedings against himself. Shortly before the AAU’s erasure of his name and records in late 1905, he had written an article for a magazine that seemed to suggest that he had received expense money while competing as an amateur, which made him a professional in the eyes of the AAU and others. The meaning of Duffey’s words to the Globe have been taken in various ways: perhaps he was saying he went over the line, or maybe the point was that while he was very much aware of the “temptations,” he didn’t participate but would tell the public what parties were doing what. The AAU statement announcing its decision was stark in its brevity: The organization was eliminating “every mark of distinction with which Arthur F. Duffey has been credited, these having been made on the assumption that he was an amateur, as evidenced by the signing of entry forms, etc. “This determination by the committee displaces the following records: Forty yards (4.6 seconds) made Feb. 13, 1899, March 4, 1899, and Feb. 10, 1900, in Boston; Fifty yards (5.4 seconds) made Feb. 21, 1904 in Washington; Sixty yards (6.4 seconds) made Nov. 30 and June 7, 1902, in New York City; One hundred yards (9.6 seconds) made May 31, 1902, at Berkley Oval, New York City. Over the next 15 years Duffey and his family and associates pressed for a hearing so that he could lay out his entire story, at one point suing for the opportunity. But, writes Turrini, a court ruled that the “AAU was a private organization and an athlete judged by it has no recourse.” Finally, in 1920, the AAU did take another look at the case, according to Turrini’s account, but it was reported that the Sullivan files had been lost in a fire, so the burden of proof was on Duffey to make his case – after he posted a $350 bond. He declined to proceed and so the matter stood for all practical purposes until the USA Track and Field ceremony this month. Pursuing his cause across the years was hardly the only thing Arthur Duffey was doing. He kept up with his passion for athletics by working for almost 40 years on the sports staff of the now-defunct Boston Post, the city’s largest-circulation paper over the first half of the 20th century, and by coaching track at both Boston College and Boston College High School for a time. He also left Dorchester for Arlington where he raised a family of three sons and a daughter with the former Helen L. Daley of Neponset. The parsing of amateur versus professional, in particular in track and field, that obtained with utmost stringency 100 years ago is now a part of history, the NCAA’s uneven and often mismanaged efforts at holding to a standard notwithstanding. The day of amateur sports organizations scouring the landscape for missteps by young athletes just trying to make their ways in highly competitive activities are mostly gone. Those who play the games have won out over those who so long controlled their lives from behind their office desks. The AAU and the NCAA fought for years over which group would get to approve individual credentials for the Olympic Games, the Valhalla of track and field competition, often leaving athletes to cope with a morass of competing regulations. Until 1978, the AAU had the hammer and used it to control all eligibility for the Olympics. That year, the Olympic and Amateur Sports Act made the AAU/NCAA competition moot, and gave the new United States Olympic Committee the right to set all the rules and and regulations concerning amateur sports in the US going forward with guidance from individual governing bodies of each Olympic sport. What would Arthur Duffey and James Sullivan have made of all this? Tom Mulvoy is a former managing editor of the Boston Globe and a native of Dorchester.